This page contains a list of articles that you will not see in the print version of TFWM. Hector La Torre shares some tips he’s picked up over the years that will make your church audio sound better. As social media becomes more important to your House of Worship, the amount of time you spend maintaining your online presence grows. However there are several ways you can spend less time monitoring your social media ministry while maintaining and increasing your online network. Mobile tech can be really helpful to pastors and those in leadership at houses of worship by increasing organization and productivity. Here’s a list of my 10 favorite apps (in no particular order) for those in ministry leadership. Many people wonder about the value of Google+, since it seems to duplicate the functionality of Facebook. However, there are some really unique aspects to Google+ that may mean it’s worthwhile for your house of worship to spend some time on it. You may have recently heard about Blackmagic Design surprising the industry with the launch of their DLSR camera at NAB 2012. We had a chance to catch up with Dan May, President of Blackmagic Design, to ask him a few questions about why they brought this product to fruition, and they effect he thinks it will have on the worship market. We’re on the edge of a major revolution in technologies for worship and this year’s event proved that to be true. The temptation of any online activity is to become someone you’re not. Why is this so often the case? This special extended “5 Minutes with…” includes the full interview with Mike Nann of Digital Rapids, and is only available on-line! Terry Wilhite reviews Cerwin-Vega’s new speaker line – the “one-up” solution. Terry Wilhite tells us why Grammy-winning artist Alicia Keys says virtual piano is as good as the real thing, and reviews the soft synth version of Alicia’s Keys, from Native Instruments. Aaron Pratt takes us through an excellent overview of SongShow Plus. David Myers tells us that by making assistive listening hearing aid compatible, churches are leading the way to doubled hearing aid functionality for people with hearing loss. Here’s an article compiled from a series that has been running in our audio e-newsletter- which you can sign up for by clicking HERE.. The series garnered much attention from readers and so we decided to repurpose it for those of you who may not have seen it. Happy reading! Jim Tomberlin provides us with his intriguing commentary about the patterns of multisite growth in the worship community. The need to record audio “on the go” is the common denominator of churches and ministries of all sizes. Terry Wilhite focuses on two options: recording with a small digital recorder and with a laptop computer. Buying a sound system, or video projection system, or lighting system, just isn’t as simple as some want to believe. It’s not like you’re going to go out to your favorite discount store to buy a refrigerator, throw it in the back of your pickup and take it home with you. Curt Taipale tells us why it’s important to plan ahead! For most of the audio world, the digital revolution is long over. Even live sound, one of the last bastions of analog mixing, has seen a shift in recent years, with more and more digital consoles turning up on tours and in permanent installations. But for many small and mid-sized churches, the move to digital has been a challenge…. Michael Jouaneh discusses how a lighting control retrofit can yield big energy savings. Lauren Hunter, a freelance writer, communications consultant, and blogger dedicated to the faith-based technology market, discusses different ways churches can connect through online communities. So God Gave You A Song! This is a short interview with Bob Lowig, Regional Sales Manager, beyerdynamic, regarding Wireless Mics. 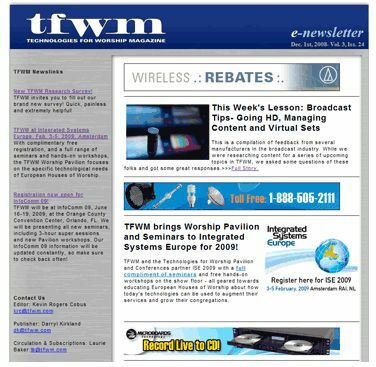 The TFWM Newsletter, produced bi-weekly, offers our readers an excellent way to stay on top of emerging trends and technologies, as well as providing relevant lessons with every issue. These lessons are also archived below, but the best way to stay current is to sign-up for the newsletter, free of charge. November 2, 2009: Production switchers are central to the professional television production environment. Installed in television studios, cable broadcast facilities, commercial production facilities, and mobile production trucks and OB vans, the production switcher not only enables cuts between different video sources, but also gives the operator the flexibility to perform these transitions with efficiency, accuracy, and creativity in the live production setting. October 19, 2009: Small screen video displays are popping up everywhere within churches – from the main auditorium to class rooms and corridors. In many cases they are replacing printed signs. Why? Cost and dynamics. October 5, 2009: The first two segments in this series provided advice and insight into establishing a single-site digital signage system and then scaling to multiple sites. The third and final segment focuses on building a true digital signage network via the software layer. September 21, 2009: The first segment of this series was a primer on a digital signage system for users who operate within a single facility or site. The goal was to provide insight on the technology, entry costs, integration, staffing, operation and most importantly, the new opportunities that digital signage deliver to worship facilities. September 7, 2009: Clear communications is an art that brings people together. Whether strictly informational or something on a more emotional level, communication is imperative to creating a relationship between the messenger and a group of message recipients. August 24, 2009: This week’s lesson sees a continuation of the popular ‘Confessions from Behind the Board’ series. It seems that everyone has at least one funny and embarrassing story to tell — whether it’s about weird sound loops, annoying and unexplainable feed back, or even stories about ‘devilish dads’. August 10, 2009: Automation plays a critical role in the reliable, efficient, and accurate playout of programming at most broadcast facilities today. The definitions provided here represent fundamental systems and concepts involved in broadcast automation. July 27, 2009: Short of major equipment failure, there is no set imperative by which every congregation plans and invests in new production and display systems. For some houses of worship, an increase in membership is the driver for realizing more flexible delivery of video, be it in-house, to a remote campus, or to a church Web site. July 13, 2009: The project seemed daunting: The leadership of 13 congregations, spread across the metro area and in to the southern part of the state, needed ongoing training. But the long (and expensive) drives to meet together were just one more thing to shoehorn in to the busy schedule of a lay leadership that had full time jobs, families, and community obligations. June 15, 2009: Utilizing an IP-based control system offers numerous advantages to any organization. Primary among these is that the system can provide Web-accessible control of virtually any electronic device, allowing the organization to manage almost every aspect of its facility, including A/V systems and lighting, from anywhere in the world via the Internet. For houses of worship in particular, remote access can be an invaluable asset, as churches often sit unoccupied for several days during the week. June 1, 2009: This is a continuation of an early ‘Most Embarrassing Moments’ lesson from Curt Taipale from the ChurchSoundCheck Discussion Group. May 18, 2009: Contemporary worship programs place more demands than ever on today’s sound reinforcement systems. For a church’s ministries to reach out and connect with all age groups in order to make the worship experience meaningful, the necessity of having the right sound reinforcement system is critical.Contemporary worship programs place more demands than ever on today’s sound. May 4, 2009: Since Blu-ray is now accepted (for the most part) as the new HD disc format standard, many questions have come up about closed-captioning and subtitling for Blu-ray Disc (also referred to as BD). April 20, 2009: The world of web development is enormous, complicated, and ever changing with a multitude of options for creating your online space. Churches especially struggle with how to present themselves online and often face financial as well as technological barriers that ultimately prevent them from having a website that not only represents their organization well, but acts as an effective communication tool. April 6, 2009: At LDI 2008, we had the chance to connect with the former LD for Lakewood Church, as he began his new position at SeaChanger Ocean Optics. Bringing with him a wealth of experience and technical prowess, he became an appropriate person to put together some lighting tips for TFWM. March 23, 2009: This article is made up of excerpts from email correspondence between a TFWM reader and two editorial contributors. We have reformatted the discussion here so that more readers can draw from the information. March 3, 2009: It’s a fine science, laying down the beats that flourish into becoming a foundation for the rest of the band. Every drummer embodies this talent differently. We caught up with Bryan Boyd, drummer for Drew Bodine (Lead Worship Pastor at Central Christian Church, Las Vegas, NV) and asked him a bit about technique and philosophy. Feb. 23, 2009: Looking to a technology to solve a church finance problem is a bit like looking to material things to bring happiness. Increased income probably won’t fix current problems either, any more than they do in a marriage. Feb. 9, 2009: Last year I wrote to our ChurchSoundcheck Discussion Group to ask about their Most Embarrassing Moment serving on the tech team in their church. Doesn’t matter if we minister on the sound, video, lighting, or music ministry — we all have them. Jan. 26, 2009: Every songwriter is looking for ways to be heard. Some are looking for booking opportunities. Some are hoping to submit songs for projects with the hope of landing a publishing deal. There are a number of websites available that provide opportunities to connect writers with film and music projects or to find opportunities to play live. Jan. 12, 2009: Most churches want to grow their membership, but few want to spend a lot of money on advertising and other marketing efforts to reach potential members.